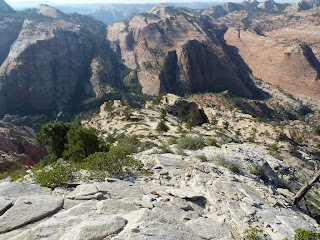 On my last trip to Zion NP, I hiked Progeny Peak again. Gene joined up with me in Zion so this time I could get him to the summit of Progeny. On a previous trip years ago, we tried to hike it from the back side. That was a fun hike, but we didn't reach the top. This time I took what I call the grandpa route; an easy class 2 walkup that skirts the class 3 sections that are steep or where the rocks move under your feet. For example, this photo shows the southern side of the summit. I hiked up that on a previous trip. 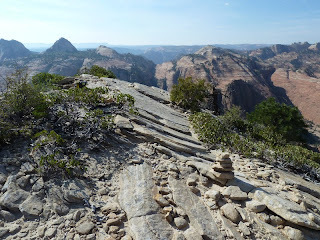 It's not so bad, but several of those large rock slabs near the top move when you step on them. I was surprised to find the large stone altar on the summit had been demolished. That's probably for the best. I posted photos of that in this past blog entry. Unfortunately, we couldn't find a summit log/register. Here's a photo of the summit. 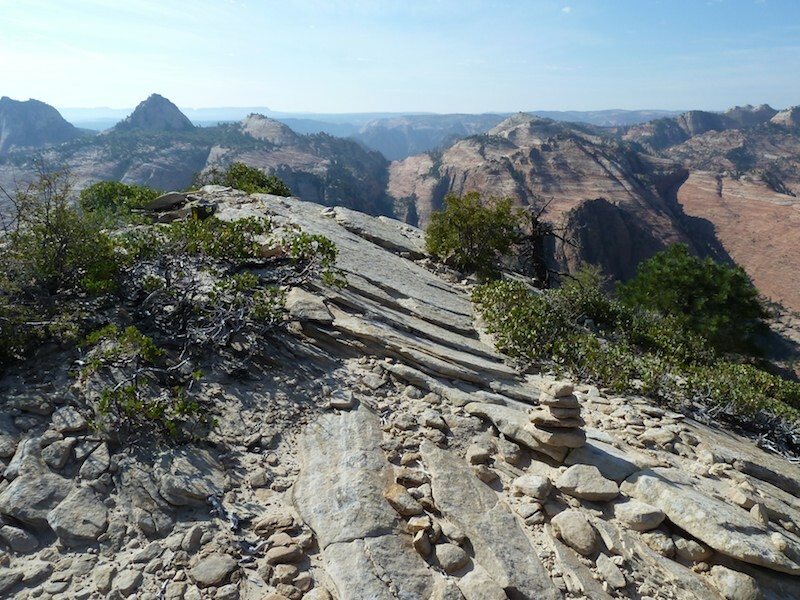 Afterward, we hiked Nippletop where Gene summited and I chickened out on the high-exposure crux near the top. Gene is a rock climber, so it was easy for him. I'll try again next week, without him coaching me: "Just grab this with your left hand and put your right foot there." and me saying: "Are you insane?"